If it is the responsibility of any serious manager is to bring balance to a discussion about possibilities then the challenge for Jurgen Klopp will change should Liverpool's story under him progress as expected. Maybe it has already. 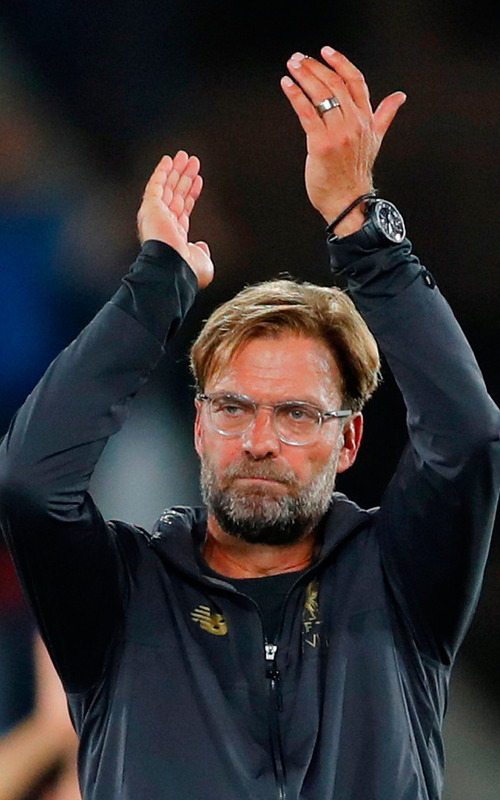 "I'm not excited," Klopp would respond flatly when asked about his team's winning start, which will extend to three for the first time in five years should Brighton be dispatched at Anfield today, an opponent that may have beaten Manchester United last weekend but has struggled away from home since becoming a Premier League club, failing to score in 12 of their 19 away games last season. It is imaginable this is a message Klopp will repeat if Liverpool continue in such vein: winning with panache as they did against West Ham before grinding Crystal Palace down, reminding then - right at the end of a testing evening - what their counter-attacking abilities can produce if you ignore them. Klopp considers his team's approach as being "offensive-orientated but based on the best possible organisation". It is not just on Merseyside where the feeling is growing that Klopp is getting there in achieving the sort of calculations that decide where the medals go. And so, whereas before he was dealing only with damnation in areas like his defence and goalkeeper, now there is only praise. The old Liverpool mantra applies here because as much as criticism can bury a player or a team, a clever manager can use it to create a group-think where players are desperate to prove the nay-sayers wrong. Acclaim was trickier in dealing with because it creeps and with that, focuses sometimes soften. In the end, it can be just as dangerous. Klopp was insistent that a bunker mentality at Melwood is strong. "I don't know exactly how much the players read but we have this kind of agreement between us, that it's not important what the outside world is saying about us," he revealed. "It's only important what we say, think and do. I think that works pretty well. "I see no signs from anybody where body language has changed. The fellas from last year have a few nice experiences on their back but I only see that they want to try again, to try to improve and try to play an outstanding Premier League season and a fantastic Champions League campaign as well as the cups. That's the plan at this moment. "We only played two football games. We won both of them. A lot of people would have expected this even though they were difficult. Now Brighton is coming and we have a new job to do. "In the Premier League, there is no easy game and Brighton is the opposite of an easy game. It will be really hard." This Liverpool team is now Klopp's team. It is also his challenge to ensure the message that helped elevate the status of players in the first place remains fresh and contributes towards maintaining ravenous appetites. Klopp always says that perfection in football does not exist because every team is ultimately beatable. It is this attitude that helped Borussia Dortmund topple Bayern Munich and become German champions in 2011 and 2012. And yet, this does not stop Klopp trying to get as close as he possibly can to what he believes to be perfect. His view on a 2-0 victory at Selhurst Park on a Monday night? "To know how to use your tools is one of the biggest arts in football - that you can really do it at the right moment," he explained. "The difference between the West Ham and the Crystal Palace game was not only the opponent but our timing in our offensive situations was not good. We did not often enough have the passing option we needed, as one example." He would remind of his expectations and then release a warning. "It's not easy to bring the right things every week on the pitch - that's what we have to try. For me as a manager, the boys need to have the same desire to play a good season like I have. "If somebody cannot deliver because of different reasons for a week, two weeks, three weeks or four, then we should have enough options as a squad to solve that. "They know why they are here and what we want to achieve - that's what we're working towards. "We want to play the best season we can play. Wherever that ends, we will see."